As we go through life, things happen to us. How we respond to them will determine their eventual outcome. God showed me a way in which we can use those things that happen to us to learn from them and to grow through them. 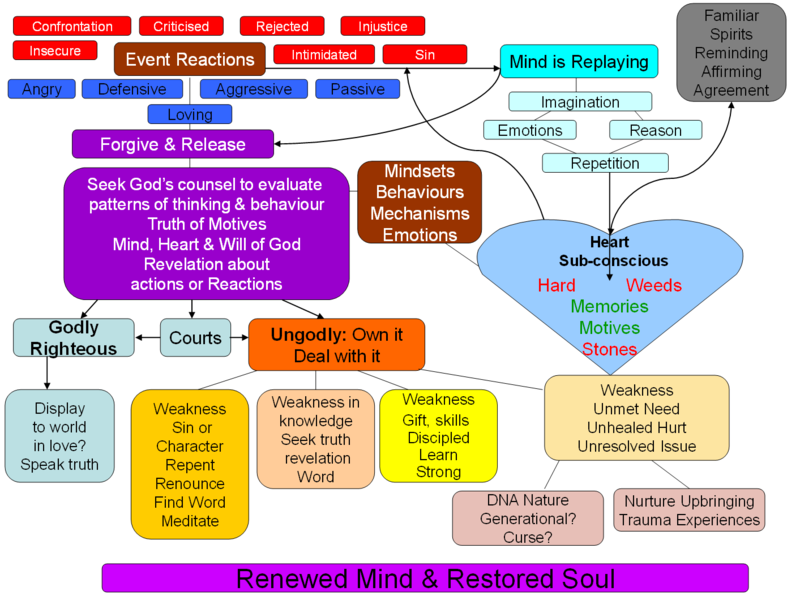 Here is a diagram which God gave me as I went through some things in my own life. Towards the top left you have an event that occurred, and your reactions to it. It might be a situation in which you felt insecure, and you reacted defensively. or a situation in which you were confronted, and you reacted angrily or aggressively – or even passively. Sometimes we get criticised by others: how do we respond to that criticism? Sometimes we feel rejected by people. What does that stir up within us? We might be faced with injustice, fear, intimidation. All these situations produce in us certain reactions or responses. Often they are automatic, and we probably think many of them are completely reasonable. But they are the defence and coping mechanisms we use to deal with the issues of life, and we have built them up over years. Now we can act lovingly in all those situations, and if we do, things will turn out well for us. But what generally happens is this: our mind starts replaying the event. If ever we find our mind going over something like this, it is a sure sign of an issue we need to deal with. A little process begins. Our imagination can picture that event, so we can remember what someone said. Our emotions are involved, so we start to feel the same emotions. We start to use our mind to try to figure it out. Denial, projection, or other defence mechanisms might kick in. We go around that cycle, repeating it over and over again. It is a form of meditation, and so those things go into our heart. Those are some of the stones, weeds and seeds that are in our hearts.They are things that have happened to us that we have not dealt with, that we have meditated on, and have allowed to find a place in our hearts and lives. Our heart can become hard because of things that have happened to us over years. Now those events have become memories in our heart, and motives for our behaviour. Familiar spirits, who know us and know what is in our hearts, will always come in agreement with them. If we feel rejected, we get little words in our heads: ‘no-one likes you; no-one wants to be around you; you are not a very nice person at all, are you?’. We tend to listen to those words because they line up with how we are feeling, and take us just a little further down that road we are already travelling. Familiar spirits will affirm and agree with those ways of thinking, and they will put thoughts into our mind which we find ourselves agreeing with, and maybe even start to confess and speak out. In that way, the course of our lives can be changed, if we operate according to the stones and weeds that are in our hearts, and from the motives that are born out of these things that have happened to us. It may have been an event that was sin. Then what comes into your mind? ‘You’re no good. God doesn’t love you. Call yourself a Christian? You’re a failure. Cover it up. Pretend. Now, what are you going to do to make yourself feel better?’ And so on, over and over again. When we face similar situations a number of times, we develop behaviour patterns according to what is in our hearts. But God wants us to see how each event, if we deal with it at the time, can be something we learn from, that benefits us, and helps us to grow. The first thing to do when you find yourself replaying a situation, or even, if you can, in the midst of the situation, is to forgive and release that situation to God. Forgiving and releasing people is one of the foundational principles of the Word of God. Jesus said that if we do not forgive, we cannot be forgiven (Matt 6:15). In that case we get caught up and live in the torture chamber of the experience that we have faced, and we carry it around with us like a ball and chain, dragging behind us all our unforgiveness, allowing it to weigh us down and make us feel heavy. So when something happens to us, regardless of whether we were right or wrong, the issue is, did we feel something in our heart? If we did, we need to forgive the person or people who caused that, and release both them and the situation. It might be that we need to forgive ourselves. If I have sinned, I need to receive the forgiveness of God by confessing that sin, so that there is no guilt, no shame, no condemnation. I do not put fig leaves on, cover it up, or try to hide in the bushes: I run to God, I receive His love and His arms of welcome, I receive His righteousness so that I can live in His presence. It may be that someone has hurt me, rejected me. I have to choose to forgive them. Whether they deserve it or not is irrelevant. I have to choose to forgive them, and not just in my head. I release them from what they have done, and I release them into the hands of God, so that I can bless them. If you cannot truly bless someone who has hurt you, then you have not forgiven and released them fully. If we carry nothing negative in our hearts towards someone, then we can freely bless them. Forgive and release is an absolutely key principle. But then, I need to deal with what happened. So I seek God’s counsel to evaluate what went on. I evaluate my thinking, my emotions, my behaviour, my attitude; whether I was aggressive, defensive, passive. I ask God to show me, and to show me His will, His heart and His mind. I ask Him for revelation about what happened. If I understand the court system of heaven, then I can go to the courts, find out who is accusing me and of what, and deal with it by receiving God’s judgment on myself and being declared not guilty. That then gives me power to change. But if you do not yet know how to do that, you can still seek God’s wisdom, and ask Him to show you where the fault lies. If it is something where you were simply an innocent victim of the situation, and completely blameless (this really does not happen that often, but let us take this as one end of the spectrum), you can pray and intercede for the person who attacked or hurt you, that God will bless them and they will be transformed (because you have already released them to God and forgiven them). Sometimes we might have to confront the person if they carry on with the same behaviour. The best way, and the one recommended in scripture, is to go to them and try to resolve the issue so that there is no breakdown in relationship between you. We do that in love, because we want the other person to be blessed and their life transformed, not for revenge (if we are looking for revenge, we have not forgiven or released properly). Our motive is really important here. If, however, you were not blameless, if it is your issue, own it. Do not deny it, excuse it, defend it: the only way you will be transformed is by owning your own issues. If you don’t admit you have a problem, how can you deal with it? If it is always someone else’s problem, you will never deal with yours. Projection is one of the most common ways of avoiding dealing with what is in our own hearts. We have to own our part in any situation. It may be that I have a weakness, a sin area, or a character issue, that God highlights in this particular situation. If so, I repent. I renounce it. I seek the word of God, ask someone else to stand with me, to pray with me, and I start building myself up in the truth that confronts that situation in my life. I can work through this, if I own it and recognise it as a problem that God can help me with. I might have what appears to be a weakness, but actually God does not want to change that in me. For example, if someone comes to me and says, ‘Mike, you are not very pastoral’, I will agree that they are right. I am not going to get defensive: being pastoral is not my gifting. I am not going to ask God to build up my gift in that area when in fact I know that I am called to be apostolic and to teach. That is why we need one another and we need all the ministry gifts to be operating, in different people. Other people here at Freedom are very pastoral, they have a great heart and a gift in that area. You need to be honest about what is going on in your heart and your life. If I am not supposed to be strong in a particular area, I need to encourage the people who are. I need to support them, and I can learn from them as well, but I am not going to try to be something I am not called to be. But if someone comes to me and says, ‘Mike, you’re not very friendly, not very sociable’, that is different: that is an issue I need to address. I need to consider why it might be that people find me unfriendly or hard to approach. I might go and find someone who is good in this area and ask them to disciple me, and to teach me how to improve. They can help me to grow and become strong. If it is my weakness, and I have an area of sin or character flaw, I need to identify where it has come from. Has it come from an unmet need? For example, if I need acceptance and try to get that from other people, I am always going to be open to being hurt and damaged. I need to look to God for acceptance. Is there an unhealed hurt in me? I can ask God to heal me and restore me. Where did those things come from? Maybe from my nature, my DNA – my family might operate in that way. It could be a curse spoken over me or over my family. There may be generational issues: ‘we are all worriers in our family’. I do not need to be controlled from my generational past: I am a new creation in Christ, and God wants me shaped by my future, my destiny and my spirit, not by my past and the defects in my soul. Then there is nurture, or upbringing. I might have been told that I am useless all my life and I have believed it. All this process allows you to see the trials and the troubles and the situations that happen in your life, and to deal with them by letting God show you what is going on, what root this has come from, what soil is nourishing it. You can do that in anything that happens to you. But you do not have to wait for something to happen to bring these issues to the surface. You can also do it by looking into your own heart, on purpose. You can choose to investigate your own behaviour, mindsets, coping mechanisms and emotions. Ask yourself, why do I feel like that? You walk into a room and you feel alone, even though it is full of people. Ask yourself why. You feel that no-one likes you: ask yourself why you feel that way. You can look at your behaviour, how you act in certain situations. and ask yourself why. We can deal with our behaviours, we can be honest about how we are living, so we can change. If we cover it up, or prefer ‘not to go there’; if we say ‘that is just how I am’, we will stay the same. If we really want to change, we have to deal with the things that are in our hearts. Am I willing to ask God to search my heart and show me if there is anything that is directing me towards ungodly behaviours and responses? Because if I am, He will.